BaptistLife.Com Forums. • View topic - EPA Better? Pruitt may be gone but he leaves a negative legacy. Not at all sure Andrew Wheeler will be better in this regard. As far as personal spending scandals (read 13 Pruitt scandals), he may be better. That's my take on it. Not the propensity to put his hands in all those cookie jars, but no improvement as far as science and policy. KeithE wrote: Pruitt may be gone but he leaves a negative legacy. 76 Environmental Rules on the Way Out Under Trump is a nice start. I'm looking forward to seeing Andrew Wheeler knock off the next 176 Obama regulations. The EPA will soon be back to being an environmental agency that does some honest good. If all that existed against Pruitt were allegations, there'd have been no need for him to resign. We have certainly turned a corner in this country, and especially among people of faith, when corrupt, immoral liars and cheaters are held up as examples of being "the best". The EPA has been nothing but a disaster since Pruitt, and a hole down which he threw taxpayer dollars. Under Trump the EPA will never have decent, credible, honest leadership, nor will any other government agency. I like the new picture. But same old bluster. Sandy wrote: If all that existed against Pruitt were allegations, there'd have been no need for him to resign. While I can agree, Sandy, this really is just bluster no better than David’s bluster. Sure has!. 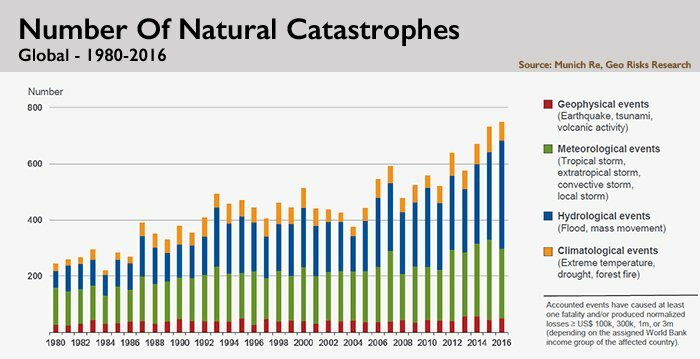 Greater than 3 times as many climate disasters in 2016 than in 1980. The good news is that even China (the biggest emitters since 2002) has reduced CO2 emissions since 2014. Europe led the way in CO2 reduction since 1980; US has reduced emissions since 2005 without lasting economic harm (may change under relaxed Pruitt/Wheeler? rules). All the world should chip in - that is the Paris Accords challenge (that Trump trashed). We drive a Prius (45 mpg) and a plug-in electric car (175 mpg effectively) and have R40 insulation. This is my annual update. Last edited by KeithE on Sat Jul 07, 2018 4:01 pm, edited 3 times in total. KeithE wrote: I like the new picture. But same old bluster. Hilarious... Anything that fails to agree with your view is "bluster." The difference David, is that I give DATA as a “bluster buster”. KeithE wrote: The difference David, is that I give DATA as a “bluster buster”. Any data that comes from denialist sources is corporate purchased and paid for, and is completely unreliable. Sandy wrote: Any data that comes from denialist sources is corporate purchased and paid for, and is completely unreliable. Thank you for your agreement and acknowledgement of the facts. Sandy wrote: Thank you for your agreement and acknowledgement of the facts. Just a few pieces on how easily Pruitt could be bought, and just how corrupt he was. Described as one of the most "blatantly corrupt" of the officials in the Trump administration, in a presidential administration that has set new lows in lack of integrity, lying and cheating, Pruitt is a sad commentary on American politics in general, and Trumpian Republicanism in particular. He had a price, and was willing to sell his country and his integrity out for money. I love this data. It goes back to Neanderthal man. I wonder how the DATA was recorded about 600,000 - 800,000 years ago when these folks lived in caves and occasionally ate each other, depending on the hunting. Maybe they smoked huge cigars and drove semi-Flintstones around. Maybe they invented the hockey-stick chart and the UN science gurus stole it. The data is from ice core data from Greenland and Antarctica. Scientists can study Earth’s climate as far back as 800,000 years by drilling core samples from deep underneath the ice sheets of Greenland and Antarctica. Detailed information on air temperature and CO2 levels is trapped in these specimens. Current polar records show an intimate connection between atmospheric carbon dioxide and temperature in the natural world. In essence, when one goes up, the other one follows. Jim wrote: I love this data. It goes back to Neanderthal man. I wonder how the DATA was recorded about 600,000 - 800,000 years ago when these folks lived in caves and occasionally ate each other, depending on the hunting. Maybe they smoked huge cigars and drove semi-Flintstones around. Maybe they invented the hockey-stick chart and the UN science gurus stole it. 2Scientists can study Earth’s climate as far back as 800,000 years by drilling core samples from deep underneath the ice sheets of Greenland and Antarctica. Detailed information on air temperature and CO2 levels is trapped in these specimens. Current polar records show an intimate connection between atmospheric carbon dioxide and temperature in the natural world. In essence, when one goes up, the other one follows. 1) The DATA was interpreted and created by warmist scientists associated with the Scientific American. The Scientific American is a pseudo-scientific publication which deals in a host of wild and crazy, other-worldly stuff. Actually, the publication mostly dabbles with global warming alarmism as a sideline. It has lost credibility with credible scientists. Here is an evaluation of the publication by biochemist Dr. Larry Moran, who is a Professor Emeritus in the Department of Biochemistry at the University of Toronto. 2) The graph posted by Keith, via the Scientific American, superimposes Michael Mann's long ago debunked hockey stick temperature graph on to a CO2 graph. Look at it again. The Scientific American graph measures 800,000 years of atmospheric CO2 of never rising above 300 PPM. Then by some alarming catastrophic reason, suddenly in the space of just 65 years, it literally goes off the chart!! Only in the world of global warming alarmism can one imagine that over 800 millennia, the atmospheric CO2 levels could NEVER have risen above 300 PPM. Here is a better and more accurate graph depicting atmospheric CO2 levels covering 600 mellennia. Here's the commentary on the preceding graph. It's interesting that Keith should mention Greenland and Antarctica as being the source for information supporting global warming. The facts of the matter are that both Greenland and Antarctic are experiencing global cooling. Here's an article that mentions both Greenland and Anarctica. Here's another. And one more. Looks like the data Keith presented was based on real research and fact. David's stuff is corporate funded. There's nothing credible in the attempted refutation. I remember a joke from years ago about what God is going to do to various Christian denominations when they get to heaven, that Baptists will have to go to a private room for 10,000 years so that God can gradually let them know there are others there, and that the Church of Christ folks will be chained to a piano for 10,000 years singing hymns. I think global warming denialists will be placed on a melting iceberg somewhere around where the Titanic went down, and they'll have to keep saying, "global warming is real, global warming is real, global warming is real." It's interesting that Keith should mention Greenland and Antarctica ans being the source for information supporting global warming. The facts of the matter are that both Greenland and Antarctic are experiencing global cooling. Here's an article that mentions both Greenland and Anarctica. Here's another. And one more. 1. No David. The data was not measured by “warmists” from Scientific American (a very well respected magazine). I asked Jim to read a SA article to support the fact that ice core measurements were not by cavemen (which he lampooned) but by Paleoclimatic researchers in this century and went back as far as 800,000 ago. You can read about where and by whom these ice core measurements were accomplished at https://www.ncdc.noaa.gov/data-access/paleoclimatology-data/datasets/ice-core. Larry Moran is an anti-evolution retired biochemistry prof and his article is about a few SA articles that he disagreed with - not any close to climate science. 2. No David. The plot I got was from the EPA. It is a composite plot (as shown by the colors) overlaying ice core CO2 data since 800,000 years ago in blue and the Mauna Loa CO2 measurements since 1950 in red. There is great deal of confirming overlap (1950-2014). 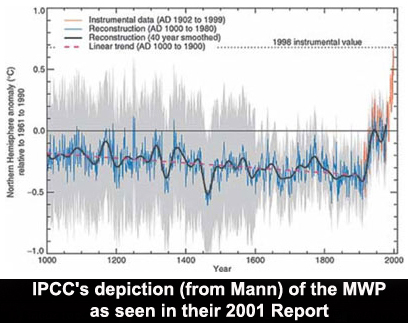 This has nothing to do with the Michael Mann hockey stick non-issue which was about temperature measurements not CO2. It is different data items. 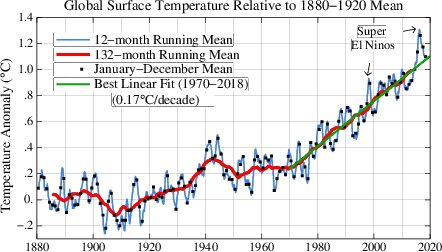 BTW, I have defended the temperature hockey stick before - the blade stands although the long stick does have more curve than the original WMO plot. It has only been debunked in the circles you choose to read. Here is up to date research conclusions from Wikipedia (it might mean something to readers, although I know David does not believe Wiki on these subject matters). A 2010 opinion piece by David Frank, Jan Esper, Eduardo Zorita and Rob Wilson (Frank et al. 2010) noted that by then over two dozen large-scale climate reconstructions had been published, showing a broad consensus that there had been exceptional 20th century warming after earlier climatic phases, notably the Medieval Warm Period and Little Ice Age. There were still issues of large-scale natural variability to be resolved, especially for the lowest frequency variations, and they called for further research to improve expert assessment of proxies and to develop reconstruction methods explicitly allowing for structural uncertainties in the process. New studies using different methods continued to extend the period covered by reconstructions. Ljungqvist's 2,000 year extratropical Northern Hemisphere reconstruction generally agreed well with Mann et al. 2008, though it used different methods and covered a different area. Studies by Christiansen and Ljungqvist investigated previous underestimation of low-frequency variability, and reaffirmed Mann et al. 's conclusions about the Little Ice Age and the Medieval Warm Period. as did Ljungqvist et al. 2012 which used a larger network of proxies than previous studies. Marcott et al. 2013 used seafloor and lake bed sediment proxies to reconstruct global temperatures over the past 11,300 years, the last 1,000 years of which confirmed the original MBH99 hockey stick graph. As for David’s 600 millennia (that is 600,000,000 years) plot - my mere 800,000 year plot is about the width of the rightmost axis. To call the CO2 data on this 600 millennia plot “more accurate” than the 800,000 plot is laughable. But I’ll read the underlying sources of these data (Scotese and Bemer) to learn more, remembering humankind appeared at most 4 millions year ago (barely bigger than the rightmost axis) - scroll down to section on humans. Earth conditions did not support life as we know it today before 4 millions years ago and the geophysics involved are totally different. Greenland and Antarctica are not experiencing global cooling. I checked your sources and they do not even make your case. 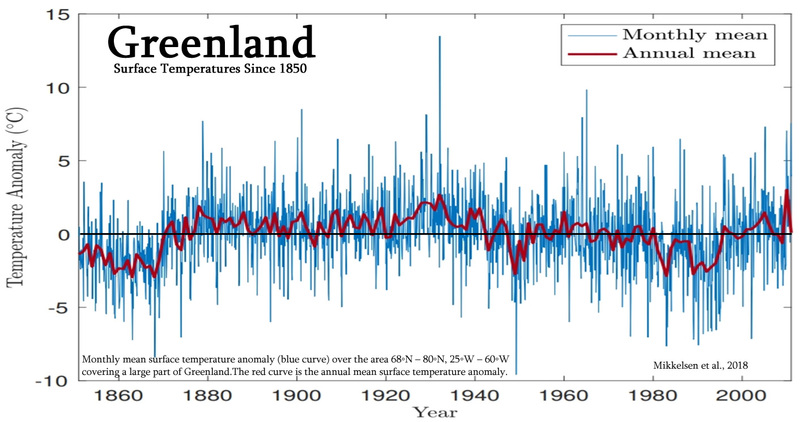 The closest date to the subject at hand (Greenland temperature) was a measurement plot that showed Greenland temperature anomaly re-analysis (not straight measurements) and it shows heating over Greenland of about 2C since 1850. David’s other “another” and “one more” are not on subject in the slightest. All articles David offered were from predictably they are from sarcastic, non-scientific denialists. Data does not support the words. The truth: Greenland's average (over all measurements stations) temperature straight measurements has been increasing since 1900 about a 1.5C increase. With these ice cores, the team was able to validate satellite measurements that showed Greenland’s ice sheet was shrinking. They found year-to-year variation in the melt rate but observed that the overall transformation of ice into liquid water was speeding up. Greenland loses on average of 270 billion tons of ice each year. The rapid increase in melting came as a decade-long pattern of atmospheric blocking — where warm air stalls over Greenland — converged with a warming phase in the ocean circulation cycle and the long-term warming trend in the climate. and is melting at 3 times the rate it was in the 1990s as it is today (the 2010’s) : Antarctica Is Melting Three Times as Fast as a Decade Ago see plot within the article. Last edited by KeithE on Tue Jul 17, 2018 12:10 pm, edited 1 time in total. Sandy wrote: Looks like the data Keith presented was based on real research and fact. David's stuff is corporate funded. There's nothing credible in the attempted refutation. Gotta hand it to you, Sandy. You have a vivid imagination and are easy prey for propagandists. ...And you are also fantastic at reciting corny jokes.